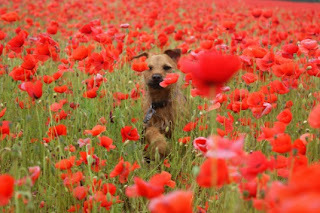 Tilly, an 18 month old Border/Lakeland Terrier cross was captured running through a field of poppies. Jennie who is sixteen entered the 16 and under category with her captivating image and won with a unanimous vote. The judges at the Kennel Club, including guest judge, famed photographer Tim Flach were so impressed they named Jennie as the Dog Photographer of the Year 2010. Jennie’s photograph, along with the winning images from the other categories ‘Dogs at Play’ (Angharad Gwenter from Llwynhendy) ’Dog Portrait’ (Terry Schmidbauer from USA), ‘Dogs at Work’ (Anne Plomp from Netherlands) and ‘Man’s Best Friend’ (Juliet Dearbergh from Monmouthshire), will be displayed at London’s leading dog event, Discover Dogs on 13th and 14th November 2010 at Earls Court. Jennie’s winning image will also be reproduced on the front cover of the December edition of the Kennel Club’s flagship publication, the Kennel Gazette. Jennie said of her triumph: “It’s truly amazing, photography is something I am very interested in and something I am hoping to go on to study. I take the camera with me everywhere and I always think what angles and what compositions would make a good picture. Jennie will now spend a day out with professional dog photographer Marc Henrie as part of her prize and her winning image will be on the front cover of the December issue of the Kennel Gazette.